ARCTIC opens with a man digging up a path – a difficult task the man might have gone on for days as rocks had to be removed from the ground. 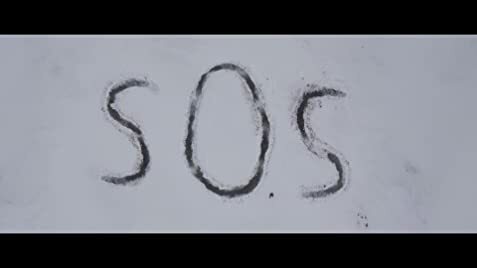 As the camera pulls back, it is revealed that it is not a path that is being cleared by the man, but part of a huge message carved out of the ice and snow with the letters S.O.S. 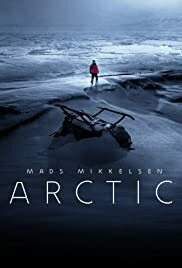 The man, Overgard (Mads Mikkelsen) has been stranded in the ARCTIC after his plane crashes and he is desperately waiting for a rescue. The film goes on for a full 20 minutes with his survival – catching and eating fish; keeping warm; sleeping etc, before something else happens. A helicopter appears. When the helicopter that finds him crashes, the pilot is killed and the passenger, a young woman (María Thelma Smáradóttir) severely injured. Overgard must then decide whether to remain in the relative safety of his camp or to embark on a deadly trek through the unknown for potential salvation.